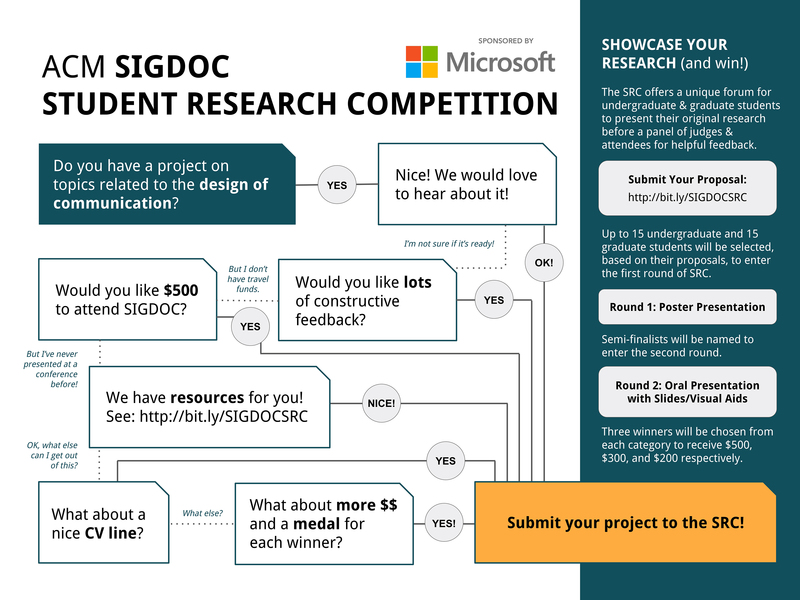 The Association for Computing Machinery (ACM) Special Interest Group on the Design of Communication (SIGDOC) invites you to submit a proposal to this year’s ACM Student Research Competition (SRC) sponsored by Microsoft. The SRC offers a unique forum for undergraduate and graduate students to present their original research at a well-known ACM sponsored conference before a panel of judges and attendees. The SRC consists of several rounds of competition, beginning with the initial submission process. Up to 15 undergraduate and 15 graduate students will be selected, based on their proposals, to enter the SRC that will be held at SIGDOC, Oct. 4 – 6, 2019 in Portland, OR. The selected students will receive travel grants from Microsoft that will pay a portion of their travel to the conference. ACM’s SRC program covers expenses up to $500 for all students invited to an SRC (students are responsible for their conference registration and SIGDOC membership, which begins at $19/year). The SRC consists of two rounds of competition at the conference, as well as the possibility to move on to a grand finals competition at a later date. Students interested in submitting proposals should be prepared to come to the conference with a poster and an oral presentation (with accompanying PowerPoint) based on their proposal topic. Undergraduate and graduate students are invited to submit proposals of up to 800 words on topics related to the design of communication, including user experience, information architecture, documentation, interaction design, and user research methods, in research, education, industry, recreation, and social exchanges. Contributions may include studies of design processes, research methods, pedagogical practices, deployment analyses, and situated use studies related to the design and use of communication systems and artifacts. Should I submit to the SRC? Submissions are due January 25, 2019. By February 15, 2019, proposal reviews will be completed and students will be notified whether they are accepted to present at the conference. The first round of competition is a poster session. This is your opportunity to present your research in the areas specified in the Call for Submissions. Judges will review the posters and speak to participants about their research; a group of semi-finalists will be chosen to present at the second round of the competition. Semi-finalists continue by giving a short presentation of their research before a panel of judges, with a supporting PowerPoint presentation. Evaluations are based on the presenter’s knowledge of his/her research area, contribution of the research, and the quality of the oral and visual presentation. Three winners will be chosen in each category, undergraduate and graduate, receiving $500, $300, and $200, respectively. First-place undergraduate and graduate student winners from the SRC will advance to the SRC Grand Finals. A different panel of judges evaluates these winners against each other via the Web. Three undergraduates and three graduates will be chosen as the SRC Grand Finals winners. They are invited, along with their advisors, to the annual ACM Awards Banquet, where they receive formal recognition. Only undergraduates may propose team-based research. Graduate students must propose individual research projects. For undergraduate teams, one person should be designated by the team to attend the conference and make the oral presentation. This person along with another team member will be eligible for travel reimbursement for up to $500.00. Please view the winners from the 2016 SIGDOC Student Research Competition.